Set a target for your rear wheel. From a trackstand, lean forward to pull an endo but give a little swing to the bars (for example opposite your strong foot). Follow up with a swing of your hips to whip the frame with your legs in the opposite direction of the bar turn (in that case, on the same side of your strong foot). 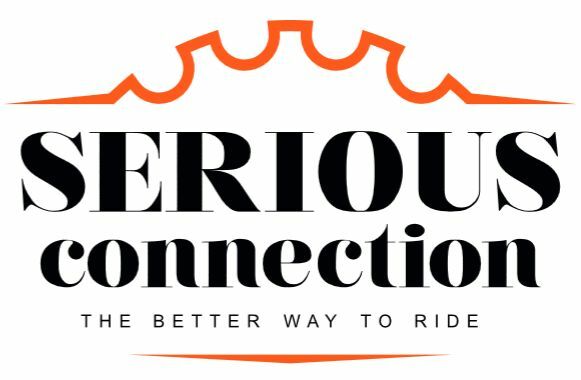 Stay tuned with your shoulders over the front wheel until the rear wheel has reached your target, then move back to force the rear wheel down. 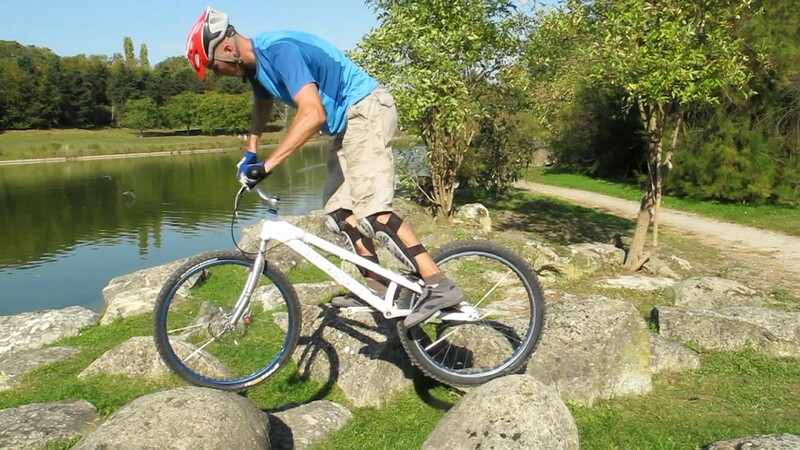 Once the rear wheel is nailed to the ground, move further back like for a back hop to lift the front wheel easily and switch the bars in the direction you want to turn. Twist your hips to the opposite side, this creates the rotational torque you need in order to spin. Stay well tuned above the rear hub for an easy spin on the rear wheel until the front wheel reaches its target. You can force the front wheel down over a precise spot by leaning forward again. 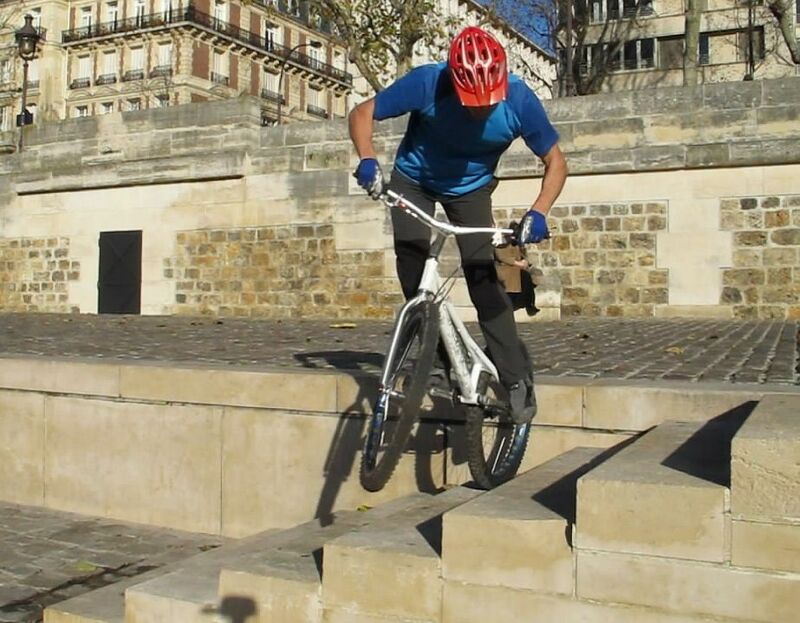 1° Move your body and lean forward for an endo, with a slight turn on the bars. 2° Give a twist from the waist to whip the frame in the opposite direction of the bar turn. 3° Stay tuned over the front until the rear wheel is above your target, then move back. 4° Once the rear wheel is nailed to the ground, move further back to lift the front wheel easily. 5° Give a twist in the bars in the direction you want to turn, as well as twisting the waist to the opposite side. 6° Stay tuned above the rear hub, for an easy spin on the rear until you reach the front wheel target. 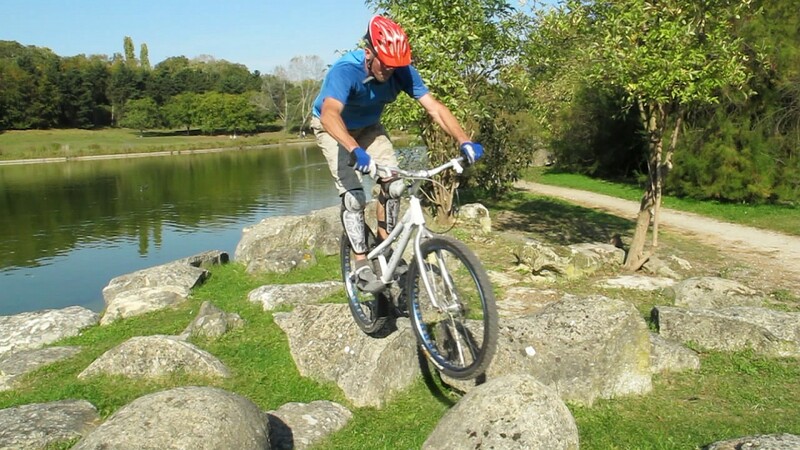 Follow some marks on the ground, and turn the bike around by lifting the front and rear wheels alternately. 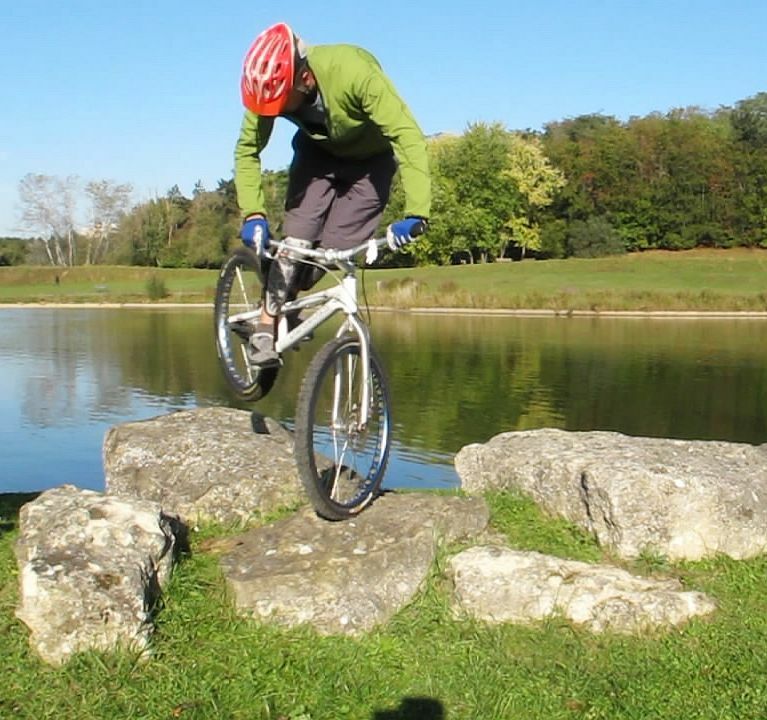 Practise some precision stops between pivots, by nailing the rear or front wheel onto specific positions. Start with less than 45°, then 90° and build it up from there by maintaining your balance longer over the front wheel. In most trials zones you won't have the luxury of choice, so practise this technique both clockwise and anti-clockwise. Off course, you can turn around endlessly by repeating these moves, but you it should be simpler and faster to turn 90 degrees on your bad side than to turn 270 degrees on your favourite side. Step sideways by alternating the rotations. It is usually easier and it feels more natural to pivot and change direction opposite your strong foot, swinging the rear wheel on your front foot side. To step sideways on precise steps, change the direction of rotation (say you move the front to the left and then the rear also to the left instead of to the right). That way you'll end up crawling sideways (instead of performing small hops). To reposition yourself over a steady obstacle, it is often more precise and less tiresome to pivot on your wheels than to hop around. 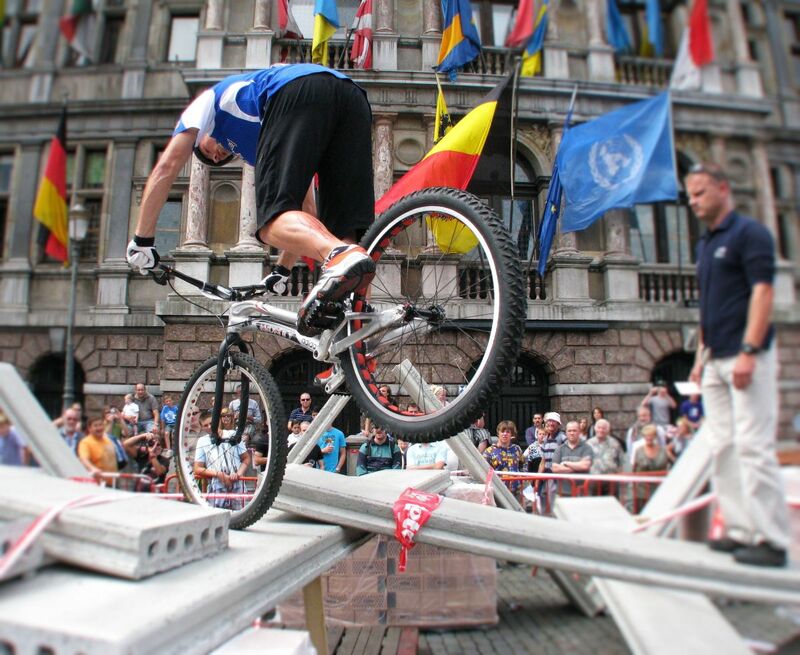 Spinning 180° over the front wheel. By giving it more amplitude, you'll be able to turn over 180° on the front wheel and over 360° on the rear wheel or bounce into a 270° back-hop. That's just what you'll need for these classy 360° drop off. Though for turning 180° or more on the front, you must really focus on the bar spin while shifting your whole body weight above the front wheel. That is what will allow you to carry on turning smoothly, in balance right above the stem, without being dragged-off sideways.